SUBHEAD: West Coast and Hawaii were hit by radioactive plumes of uranium/plutonium from Fukushima explosion. Image above: Animated GIF simulation of Fukushima Daiichi #3 Reactor explosion releasing contents of reactor into atmosphere superimposed on actual video. From (http://iangoddard.com/fukushima01.html). 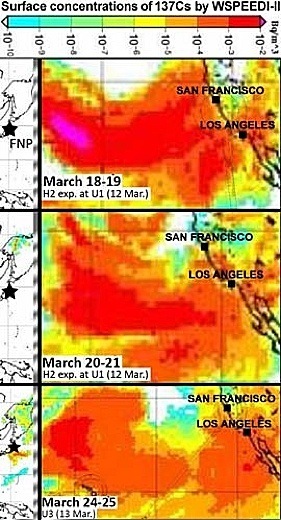 The West Coast was hit by radioactive plumes from both massive Fukushima explosions — Maps of L.A. and San Francisco covered in red clouds removed from latest paper — Total releases ‘clearly larger’ than previously claimed — ‘Significantly’ higher discharges flowed toward U.S. Image above: Mapping of western Pacific Ocean and California showing Cesium surface distribution in late March 2011. From original article. 13 March – evening of 14 March: The plume discharged… over the Pacific Ocean and increased air concentration at Sacramento California, Melbourne Florida, Sand Point Alaska, and Oahu Hawaii… a hydrogen explosion also occurred [during this time period] at Unit 3 at 11:01 on 14 March. Noon of 16 March – early morning of 20 March: WSPEEDI simulation shows that the plume primarily flowed toward the Pacific… this plume affected the air concentrations… in Alaska and Oahu… [T]he release rate is revised by using recently obtained monitoring data. The release rates [are] several times larger than those estimated previously for the afternoon on 16 March to the noon on 19 March. Video above: Explosion at Fukushima Daiichi Reactor #3 appears to eject massive amounts of nuclear fuel. From (http://youtu.be/1Q3ljfLvHww). UPDATE from Ian Goddard on 4/21/11: I now believe the best explanation for Unit 3 is an ex-vessel steam explosion (http://iangoddard.com/fukushima01.html). A steam explosion does not exclude a nuclear criticality as considered in this video (in fact the explosion of the Borax test reactor was both a criticality and a steam explosion (http://youtu.be/8WfNzJVxVz4?t=13m27s), but at the same time a steam explosion does not require a criticality because interactions of molten fuel and water are sufficient to generate a steam explosion.